On a physical level, Thai yoga bodywork incorporates compression massage (pressure, as needed), meridian & pressure point therapy, and gentle assisted body stretches and movements. No yoga experience or special flexibility is necessary. Thai massage grew out of the values and principles of Ayurveda, the Indian sister science of yoga healing) Buddhism. Thai yoga therapy approaches the human being as a physical, spiritual, mental and emotional system. A Thai therapist is trained to work with the individual in a holistic manner, while also considering the health and well-being of the therapist. This form of bodywork is a wonderful and effective therapy for the whole body. It effectively targets specific symptoms, as needed, while imparting harmony, integration and well being throughout the mind and body. 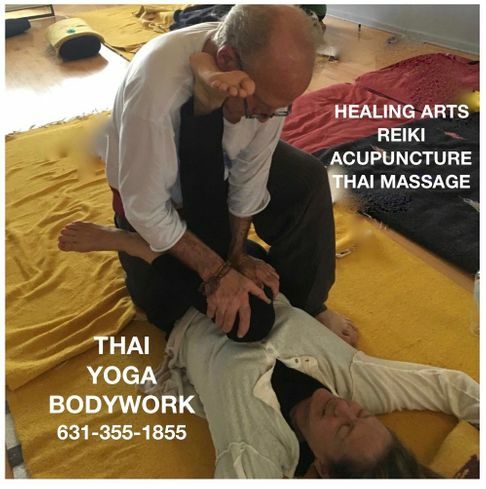 Thai bodywork originated in India thousands of years ago, and was (and is today) practiced as a primary and holistic form of medicine, as well as a folk art. Dr. Jivaka Komarabhacca or Jivaka Kumar Bhaccha, also called Shivago Kumarpaj, is considered the source and authority of Thai Massage all over Thailand and also is seen as the founder of Buddhist Thai-medicine. Numerous ancient documents describe his extraordinary medical abilities and his knowledge of herbal medicine as well as his treatment of prominent people. He was the personal physician of of Siddharta Gaudama – the Buddha.